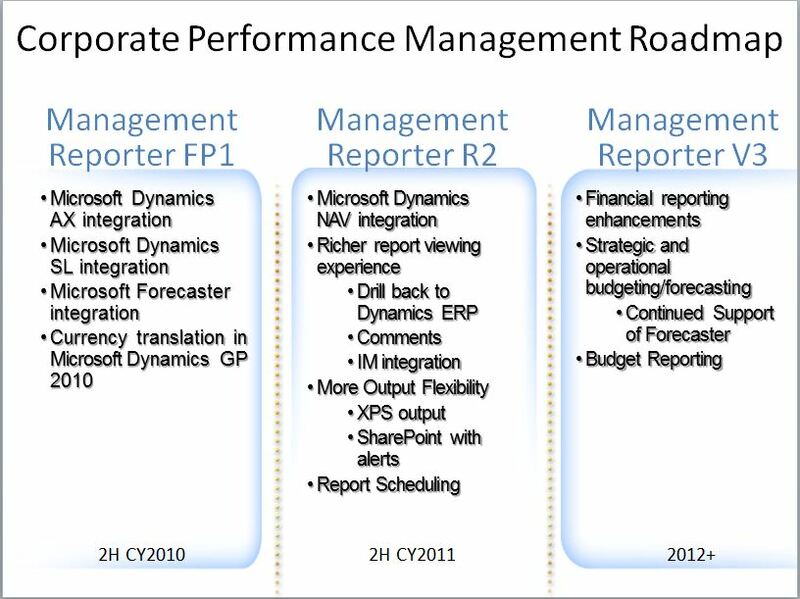 Microsoft has changed their Product Road Map for Corporate Performance Management which includes Management Reporter -a Financial Reporting tool (FRx replacement) and Forecaster – a financial budgeting tool. At Microsoft’s recent conference (Convergence), the Corporate Performance Management products show “continued support of Forecaster”. Originally, Microsoft was going to extend budgeting into Management Reporter and discontinue Forecaster, not anytime soon. 1. Data provider updates to Dynamics AX 2009, Dynamics, GP 2010 and Dynamics GP 2010 R2. 3. Better support for rounding and adjustment periods. 4. Performance improvements for larger databases. This entry was posted in Forecaster, Management Reporter. Bookmark the permalink.